'One Bright Star' is a very refreshing addition to Christmas repertoire for young people, with songs that are not only catchy and easy to teach but also have great character and emotional appeal. As one reviewer puts it, this cantata truly has 'star quality'! This short cantata re-tells the most significant parts of the Christmas story in five particularly attractive songs with linking narrative. 'One Bright Star' makes a lovely centrepiece for any carol concert, with beautifully orchestrated backings on the CD to enhance performance. Although singers may perform in unison, the harmony parts are lovely and easily achievable. Singers' booklets are available. "This was absolutely the most user friendly cantata for children I have ever done! Hard to pick a favorite from the 5 songs as they were all so awesome. The children loved it and that made it easy to learn and present." ~ R Sanchez - Choir Leader. This is one of the most delightful cantatas I've had the pleasure to use. The music is catchy and had the children caught straight away. The title song 'One Bright Star' is beautiful. I would thoroughly recommend using it. This was absolutely the most user friendly cantata for children I have ever done! Hard to pick a favorite from the 5 songs as they were all so awesome. The children loved it and that made it easy to learn and present. Looking forward to what you offer for next Christmas! Perfect For A Church Carol Service Or Concert. 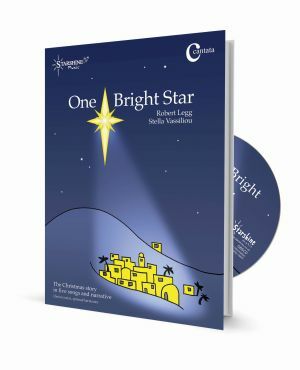 One Bright Star- This short cantata was an excellent choice for a church carol service or concert for our Key Stage 2 children to perform. We combined the performance with some traditional carols for the congregation and it was a perfect re-telling of the Christmas story in song. Children loved the songs and as we perform very early in December it was good that they could learn the songs easily and quickly. Thank you. Very Good. The variety of styles and catchy nature of the tunes were appealing to my pupils. Good combination of solo opportunities and massed singing. Attractive easy to learn songs which appeal to children over a wide age range. Review by Glenda Doucy - Teacher, New Zealand. The children learned the songs very quickly and responded positively to their vibrancy. The harmonies in the arrangements, together with the lyrics, created a powerful Christmas message. The range of styles and appealing melodies hooked the children and they loved it. Choir members swelled as we were heard beginning to rehearse. 'One Bright Star' uses authentic Christian narrative as its lyrical foundation, and yet the songs will have a wide appeal that extends beyond the Christian community. Very good! Review by David Bennetts - Teacher, Head Of Music, Christchurch, New Zealand. I would highly recommend this resource to other schools. It allows schools to present a significant portion of the Christmas story in a succinct and effective way without needing to go to great lengths in terms of staging, costuming etc. Review by Veronica Bennetts - Conductor, The Midlands Children's Choir. I have to tell you that I tried out the lead song 'One Bright Star' with my choir on Sunday. All I can say is that we all fell in love with it together! I've been humming it ever since. It really does have star quality as a song - satisfying chord progressions and harmonies, with enough 'quirkiness' to make it different, whilst remaining completely singable. I'm not surprised it has done so well in the songwriting contest. Review by Lisa Fegan - Teacher & Music Subject Leader, East Sussex. Good fun to teach and perform. Quite memorable. One child who doesn't usually like music said, ' I really enjoyed that! I would strongly recommend this cantata to other schools. The melodies of the songs are very attractive. The children and I so enjoyed working on it and performing it.